The team approach to stroke management starts with Emergency Medical Services and continues at a hospital within a Stroke System of Care capable of delivering Acute Stroke Care in the Emergency Department and in a dedicated Stroke Unit.The goal for the acute medical management of patients with stroke is to stabilize the patient and to complete initial evaluation and assessment, including imaging and laboratory studies, within a short time frame. Critical decisions focus on the need for intubation, blood pressure control, and determination of risk / benefit for thrombolytic intervention. Patients presenting with Glasgow Coma Scale scores of 8 or less or rapidly decreasing Glasgow Coma Scale scores, require emergent airway control via intubation. Prompt Triage - In the interest of saving time, some EMS actions can be accomplished enroute. Limit assessments / Care on scene to those that are urgently needed or clearly indicated by the patients presentation. <span style="white-space: nowrap;" />Tissue Plasminogen Activator (tPa) for the treatment of acute ischemic stroke must be given within 4.5 hours from the onset of symptoms. Ideally, tPA should be administered (“door to drug”) in less than 60 minutes after Emergency Department arrival. Evidence confirms that the sooner tPA is administered, the more optimal the results. Outcomes are best when patients are admitted directly to and receive care in a dedicated stroke unit, where recovery and rehab can begin immediately. Hospitals without full stroke care capabilities should have official transfer agreements with hospitals offering a full complement of stroke care, and patients should be transferred as soon as reasonably possible. There are a number of Strokek Management Algorithms used both by the EMS Services and Acute Hopitals in order to effectively triage and manage the flow of patients suspected of Stroke to improve access to best possible treatments available. 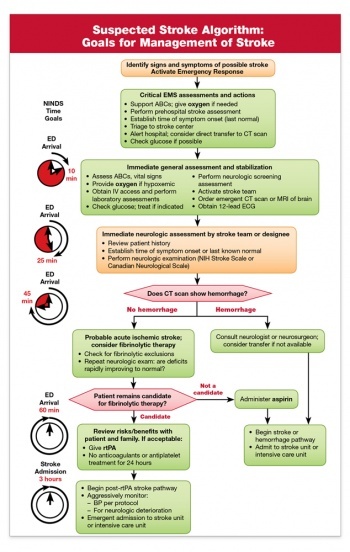 The new Severity-based Stroke Triage Algorithm developed by the American Heart Association/American Stroke Association provides ambulance crews with information and tools to better identify a stroke, assess a patient’s condition and determine the best hospital for specific treatment needs. Indication for thrombolysis or early anticoagulation. Patients with acute stroke without the above indications for immediate brain imaging, scanning should be performed within 24 hours after onset of symptoms. In the case of an Ischemic Stroke, the more rapidly blood flow is restrored, the ore likely for improved recovery and fewer brain cell deaths. Primary treatment is aimed at breaking down the clot through means of medication (Thrombolysis) or mechanical removal of clot (Thrombectomy). Other treatments aim to minimise the clot becoming larger or prevention of new clot formation by means of anticoagulant type medications such as Aspirin, Clopidogrel or Dipyridamole. In conjunction with this, overall patient medical condition should be managed including montoring of blood sugars, oxygen levels and hydration and providing adequate treatment for same. All patients with disabling acute ischemic stroke who can be treated within 3 - 4.5 hours after symptom onset should be evaluated without delay to determine their eligibility for treatment with intravenous tissue plasminogen activator . Tissue Plasminogen Activator (tPA) is a medication that dissolves blood clots. It is called a thrombolytic agent or more commonly referred to as the “clot buster.” It is an intravenous or IV medication usually given through a catheter inserted into a vein in the arm. Rapid administration of intravenous tPA to appropriate patients remains the mainstay of early treatment of acute ischemic stroke. For patients who meet national and international eligibility guidelines, intravenous tPA administration improves functional outcomes at 3 to 6 months when given within 4.5 hours of Ischemic Stroke Onset and should be administered. Every effort should be made to shorten any delays in initiation of treatment as earlier treatments are associated with increased benefits . The goal of therapy for ischemic stroke is to safely maximize patient functional recovery to pre-stroke baseline by rapidly reperfusing the ischemic penumbra. tPA has optimal use within 3 hours from onset of symptoms but in carefully selected patients there is a longer time window for treatment up to 4.5 hours. Studies continue to support that time from onset to treatment with tPA is directly related to outcomes in Ischemic Stroke. The sooner tPA is given, the greater the benefit (Stroke, 2013). Beyond the approved and recommended time windows for tPA use, risk of complications rises. tPA is no different from other medications in that it has potential adverse effects, which makes it essential that a careful consideration is given to exclusion criteria, risks and benefits for use in each individual patient. The major complications is symptomatic intracranial hemorrhage which occurs at a rate of roughly 5.2%. Other complications include orolingual angioedema (allergic reaction), acute hypotension, and systemic bleeding  . Physical removal of a blood clot can be completed by Endovascular Therapy either through a Catheter Based Drug or Mechanical Thrombectomy to dissolve or remove the clot and is another strongly recommended treatment option in Ischemic Stroke. Recent research has shown positive results for carefully selected patients with severe stroke due to proximal arterial occlusion and in whom recanalisation can be achieved within six hours of symptom onset, and compared to patients treated with standard medical treatment alone those who also had mechanical thrombectomy were more likely to be functionally independent at three to six months . The availability of endovascular treatment raises new opportunities for patients with severe stroke but also poses new challenges for stroke services. Observational and clinical trial data suggest that 7% to 13% of patients with acute stroke are potentially eligible for endovascular treatment but currently availability and access to endovascualr therapy poses new challeges as not all hospitals have the resources and expertise necessary to provide this treatment option. Stroke Services must develop systems in order to work with Hospitals who have Interventional Radiology available and be able to triage and transport eligible patients within the required timeframes. The Mechanical Embolus Removal in Cerebral Ischemia (MERCI) Thrombectomy System which is a looped wire with progressively smaller loops, that is sent through to the clot via a small catheter. As the catheter is withdrawn, the coiled wire is deployed, which captures the clot for removal. The Penumbra Thrombectomy System uses aspiration for clot removal from large intracranial vessels. With a suction catheter at the proximal end of the clot, the device continuously debulks and aspirates clot debris until the vessel is clear. The device can remove a clot in a matter of minutes. The Solitaire Flow Restoration Device and the Trevo Retriever Device have the ability to bypass the clot and restore flow and retrieve the clot. Studies have shown that when clot retrieval is performed within six hours of symptom onset, 60-68% of patients achieved post-procedure revascularization. Patients eligible for clot retrieval are those with recent ischemic stroke, who can receive treatment within at least preferably 3-6 hours of the onset of stroke signs and symptoms. Those patients with uncontrolled HTN, internal bleeding, seizures, blood clotting problems, or those on anticoagulants are not candidates for this procedure. Complications from clot retrieval procedures include hemorrhage, internal bleeding, death and recurrence of stroke  . Once a hemorrhagic stroke is brought under control with emergency care, further treatment measures can be taken. If the rupture is small and produces only a small amount of bleeding and pressure, supportive care may be the only other form of care you need. But in some case surgical procedure may be recommended to repair the ruptured vessel, stop bleeding, or prevent further bleeding, for more serious strokes. Surgery may also be required to relieve the pressure caused by the bleeding and brain swelling  . An aneurysm is a blood vessel that has a weak area that balloons out. If the area ruptures and bleeds, a hemorrhagic stroke can occur. A clamp can be placed at the base of the aneurysm to prevent bleeding before a stroke or to prevent re-bleeding. This surgery requires removing a piece of the skull and locating the aneurysm within the brain tissue. Coil embolization is an interventional procedure that is less invasive than clipping. It involves inserting a catheter into an artery in the groin. The catheter is guided along blood vessels in the body into the vessel in the brain where the aneurysm is located. A tiny coil is advanced into the aneurysm, filling the area with the coil. A blood clot forms within the coil, blocking blood flow into the aneurysm and preventing it from rupturing again. Other materials may also be injected to obliterate an aneurysm or AVM  . If the stroke is caused by an Arteriovenous Malformations (AVMs) surgery may be used to remove it. This is not always possible, however, and depends on the location of the AVM. Some AVMs have a significant risk of further bleeding. The decision to treat an AVM depends on several factors; includin patients age, location and size of AVM, and abnormalities of the veins that drain the AVM and whether or not the AVM has previously bled. Treatment could include surgery, radiosurgery (use of radiation to shrink blood vessels), or embolization techniques . 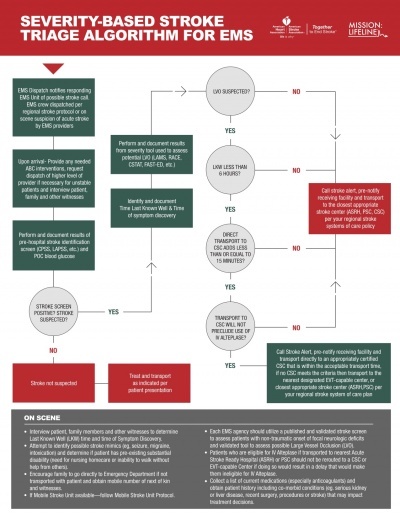 When a patient’s life appears to be threatened because of the pressure effects of a blood clot in the brain, the physician may consider a procedure to open the skull and/or remove the blood. Considerations include the location and size of the hemorrhage, the patient’s age and medical condition, and the likelihood of making a recovery from the stroke  . This is a video simulation of what its like to be a stroke patient at Massachusetts General Hospital (MGH). The full video is approximately 15 minutes. These videos are created the Massachusetts General Hospital (MGH) Stroke Service in an effort to increase stroke education among patients and caregivers. ↑ Adams H, Adams R, Del Zoppo G, Goldstein LB. Guidelines for the early management of patients with ischemic stroke: 2005 guidelines update a scientific statement from the Stroke Council of the American Heart Association/American Stroke Association. Stroke. Apr 2005;36(4):916-23. ↑ 2.00 2.01 2.02 2.03 2.04 2.05 2.06 2.07 2.08 2.09 2.10 Powers WJ, Derdeyn CP, Biller J, Coffey CS, Hoh BL, Jauch EC, Johnston KC, Johnston SC, Khalessi AA, Kidwell CS, Meschia JF. 2015 AHA/ASA focused update of the 2013 guidelines for the early management of patients with acute ischemic stroke regarding endovascular treatment. Stroke. 2015 Jan 1:STR-0000000000000074. ↑ Prasad K, Kaul S, Padma MV, Gorthi SP, Khurana D, Bakshi A. Stroke management. Annals of Indian Academy of Neurology. 2011 Jul 1;14(5):82. ↑ Jauch EC, Cucchiara B, Adeoye O, Meurer W, Brice J, Gentile N, Hazinski MF. Part 11: Adult Stroke. Circulation. 2010 Nov 2;122(18 suppl 3):S818-28. ↑ 8.0 8.1 Rodrigues FB, Neves JB, Caldeira D, Ferro JM, Ferreira JJ, Costa J. Endovascular treatment versus medical care alone for ischaemic stroke: systematic review and meta-analysis. BMJ 2016;353:i1754. ↑ 11.0 11.1 11.2 11.3 11.4 11.5 BMJ Best Practice. Haemorrhagic Stroke. http://bestpractice.bmj.com/best-practice/monograph/1079/treatment/guidelines.html (accessed 2 May 2017).